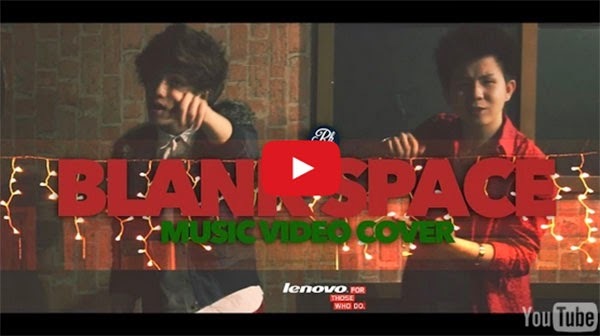 Young Filipino talents Ranz Kyle and Karl Zarate ruined Taylor Swift's "Blank Space," the American singer-songwriter's fan group Swifties said. Known on social media as RK and KZ, the two collaborated for a cover of Tay's hit pop song, a number one track on the U.S. Billboard Hot 100 following "Shake It Off." The duo posted the Lenovo Yoga Tablet 2 Pro-sponsored music video on YouTube on Sunday, December 14. It became a trending topic on Twitter, but received negative feedback from Taylor's fans. "@dresty98: SWIFTIES BE LIKE: #BlankSpaceCoverByRanzAndKarl pic.twitter.com/a72TYeBnIx"
The hashtag #BlankSpaceCoverByRanzAndKarl was on the number 2 spot on Twitter's trending list as of 8:30 p.m. Sunday.